- DC voltage gain 100V/mV Typ. 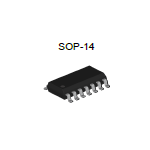 The LM324 consists of four independent, high gain, internally frequency compensated operational amplifiers which were designed specifically to operate from a single power supply over a wide range of voltages. Operation from split power supplies is also possible and the low power supply current drain is independent of the magnitude of the power supply voltage. Application areas include transducer amplifiers, DC gain blocks and all the conventional op amp circuits. Copyright 2008 TAEJIN TECHNOLOGY Co., Ltd. All Rights Reserved.